“Art on Lake” on Budapest’s City Park Lake, with the scenic Vajdahunyad Castle illuminated at night. 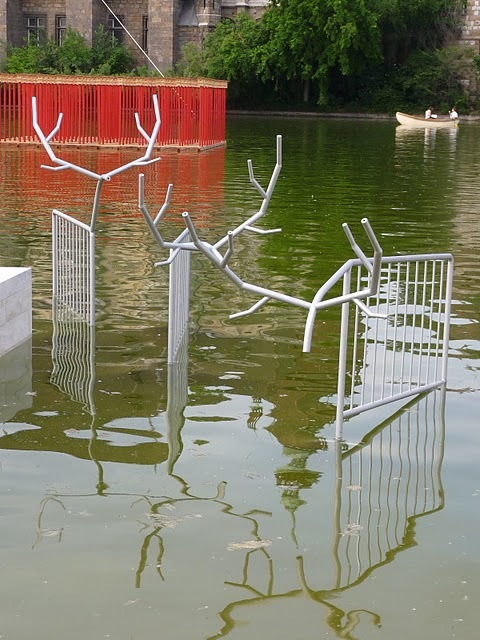 How do you like the idea of a sculpture exhibition with the works set on the surface of a lake? Clever idea or a gimmick? I was leaning towards gimmick when I received an invitation to see such a show taking place in Budapest this summer. It’s organized by the city’s Museum of Fine Arts (MFA) and takes place on an artificial lake in City Park, a short walk from the museum across Heroes’ Square. “Art on Lake,” which opened at the end of May, marks Hungary’s presidency of the European Union (the term ended July 1) and includes one work each by 25 artists representing 16 E.U. countries (Hungary itself has 3 participants). The gathering of old and emerging artists from across Europe may be an international event, but “Art on Lake” inevitably will have its greatest impact on the locals. Officials at the MFA, whose exhibitions center on a renowned collection of Old Masters, consider the project an instrument for introducing an uninitiated public to the pleasures of contemporary art. When I arrived the day after the vernissage I had my doubts that the students would show up for class. It was hot and muggy, slightly overcast, and the only people around were publicists, a couple of curators, and a few of the artists waiting to fly back home. The target audience was absent and the place felt desolate. I joined the others near a Baroque-style pavilion that services ice skaters in winter and row boaters in summer, but was shuttered for an E.U.-sponsored renovation. Sitting on plastic chairs we ordered bottles of tea from a poorly stocked makeshift café and gazed at the brooding Vajdahunyad Castle, an ancient-looking historicizing mélange built a century ago to celebrate the supposed millennium of Hungary’s founding. Talk ranged from the rise of right-wing forces in Hungarian politics, to cutbacks in funding for European artists, to the difficulties of installing works on the cement-bottomed shallow lake. I could not help but notice that pedestals beneath some of the artworks were visible above the water line. Was this a temporary problem? I asked. Several artists rolled their eyes. It seemed the lake had been drained for installation, and when the water was let back in it failed to reach the expected level. Everyone agreed this was not catastrophic but frustrating nonetheless. How depressing, I thought. This must be typical of post-Soviet Eastern Europe. Like most international group shows, it’s of uneven quality and without a coherent theme. There are abstract, conceptual, neo-surreal, and socially engaged works, some intriguing (or at least well-meaning) and others simplistic or even silly. A few might best be characterized as lazy. The roster embraces much of the E.U. (11 of the 27 member countries are absent, including Ireland, Portugal, Sweden, and Bulgaria) and includes artists of modest renown, particularly in the U.S., as well as several international stars. Alexander Tolnay, a Hungarian independent curator living in Germany, worked with co-curators Péter Fitz, director of the city’s Kiscelli Museum, and art historian Krisztina Jerger. Tolnay told me the team sought works that “either give you a surprise – like a park bench or toilet in the middle of the lake [I’ll get to those examples in a moment] – or merge into the environment of the [aforementioned] castle. They had to either harmonize or irritate,” he says, adding that the results – two thirds of which were newly made for the exhibition – range from ironic, to playful, to earnest. That’s about right. The most compelling and effective work on the lake is Tea Mäkipää’s Atlantis, a pale-green peak-roofed house set atilt as if sinking beneath the surface. Evocative not only of natural disasters that have become all too familiar in the age of global warming, it also alludes allegorically to larger themes of philosophical inundation and epistemological shipwreck. A Finnish artist living in Berlin, Mäkipää knew how to respond to the exhibition’s unique setting. Another eye-catching piece is Hungarian Balázs Kicsiny’s Delayed Departure, Hurried Return. Four checkerboard-painted automobiles, joined at the back, each containing a crash-helmeted manikin seated as if to dine at a round table in the cars’ conjoined interiors. The vehicles are positioned to speed away from one another, suggesting the passengers’ inevitable isolation. Kicsiny, who represented Hungary at Venice in 2005, says, “The aim is to condense the contradictions of experiencing space and time into a visual paradox.” It misses in that respect, but row-boaters gravitate towards the enigmatic assemblage. Perhaps it does illustrate some metaphysical riddle. 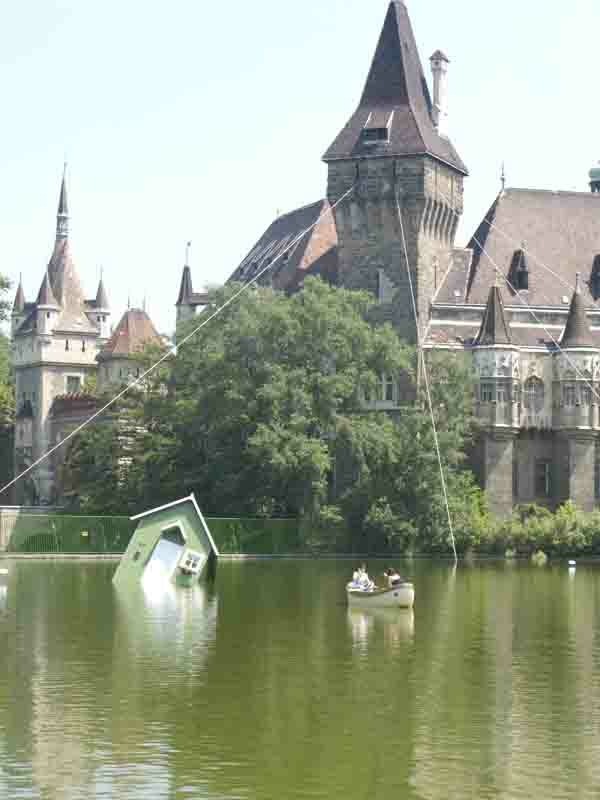 The largest and most prominent installation is by Mimmo Roselli, an Italian who extends ropes from points of the Vajdahunyad Castle to the surface of the lake (see images above). His colossal drawing in space links the outlines of the architecture to the water plane, a spatial delineation that calls to mind work by Fred Sandback, Waltercio Caldas and others. Also appealing is a piece by Jaume Plensa, the Catalan whose work of late has become a well-known brand at art venues around the globe. 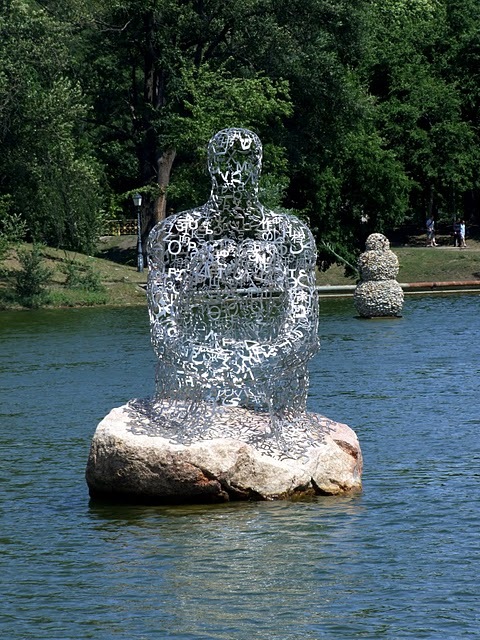 He sent a work from his now familiar “Souls – Nomads” series (begun in 2005), a stainless-steel seated figure on a rock, his skin an openwork net of letters that form words in various languages. “Letters are bricks of our souls,” muses MFA director László Baán, who considers it “the most impressive” work in the show. But most of the big shot artists disappoint. Poland’s art doyenne, Magdalena Abakanowicz, whose shows at the MFA (2005) and Kunsthal (1988) have given her unique exposure in Budapest, contributes a folded metal V-shaped piece with upward slanting wings. Bird (2005) suggests an abstract dove or moth hovering above the lake, but the slight monochrome piece fails to take flight. Anne and Patrick Poirier’s tableau evokes classical civilization and myth. Anne and Patrick Poirier, the French couple enamored of an end-of-civilization theme, show a previously exhibited group of antique-style human figures and an energetically rampant horse that emerge from the water near a downward-pointing arrow. The semi-submerged Baroque-style sculptures suggest a mythic narrative being subsumed by the ages, but like the half-buried Statue of Liberty in Planet of the Apes their gravitas sinks into kitsch. German artist Willi Weiner also culls antiquity for content and comes up with a stylized reminiscence of Greco-Roman amphorae. The pair of over-sized, mildly abstracted, rusted-steel pots constitute yet another vanitas of classical culture, tokens of a hackneyed notion oxidizing in the sun. Krysztof Bednarski’s Pop Karl Marx column fountain. I expected more fountains – something to rival Jean Tinguely and Niki de St Phalle’s Stravinsky Fountain (1983) outside the Pompidou, or Isamu Noguchi’s astounding Floating Fountains (1970) in Osaka. 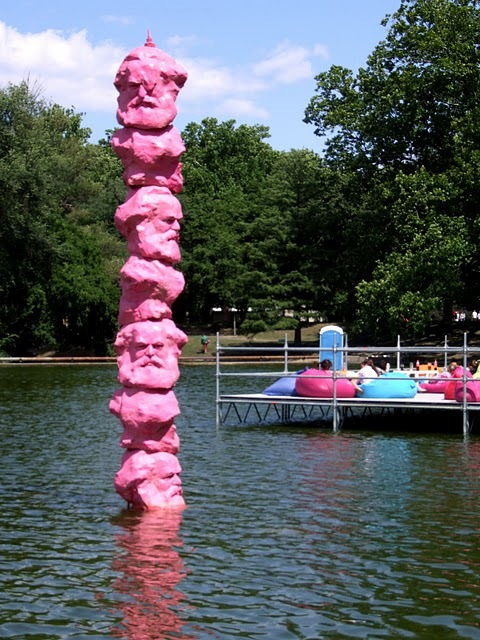 But, the only waterworks are by Krysztof Bednarski, a Polish artist living in Rome, who stacks seven pink-resin heads of Karl Marx to form a 15-foot pillar with water sprinkling out of the top. This sort of agitprop Pop Art takes pleasure in mocking the once-revered Communist philosopher, and may strike a provocative chord among anti-Soviet Hungarians, but to cosmopolitan art aficionados it feels clichéd and clownish. Czech multi-disciplinary artist Jirí David’s over-sized red-and-white Cane for the Blind, a work that could be mistaken for a Claes Oldenberg were it not such a humorless motif. Rather than a reminder to help those with poor eyesight, I imagine it’s a symbol of our collective perdition, or perhaps a wise-guy rebuke of the supposedly blinkered sensibility of his audience. David heads the Intermedia Studio at the Academy of Fine Arts in Prague, so maybe there’s something more here than meets the eye. Nearby is Eric Binder’s Waiting, a park bench and streetlamp set mid lake, inaccessible and slightly surreal, as if there had been an unexpected flood, or urban planning had been overseen by Magritte. In the distance is a stone snowman garnished with a palm frond., the simplistic sentinel of climate change by Daniel Knorr, who represented Romania at Venice in 2005 by leaving the post-Ceaușescu nation’s pavilion vacant. Here he joins a legion of Europeans preaching heightened awareness of our fragile environment. Via Lewandowsky set a plastic outhouse in an inconvenient location. East German-born Via Lewandowsky planned to spill oil or some other toxin into the lake. 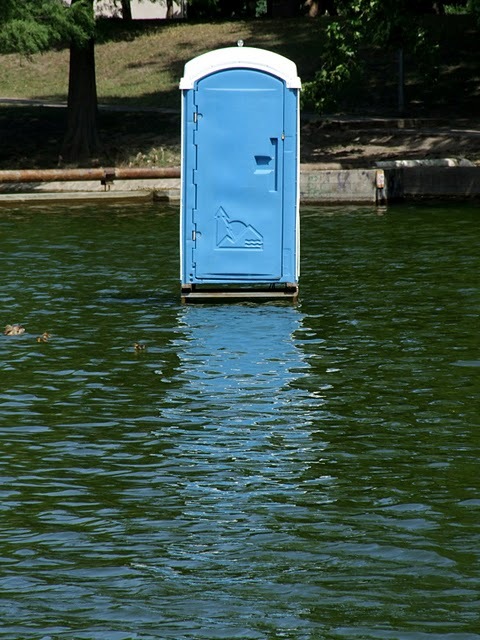 Instead she installed a blue plastic outhouse in the middle of the water. An attention-getter, to be sure, it reads more like a slapstick joke than a grim admonition about pollution. It’s silly and quite ugly, which I suppose was her point. A more subtle and nuanced expression of ecological concern is a pair of flowery floating islands by Ilona Németh, a young artist from Slovakia. Her artificial Private Islands are intended as sites of guerrilla gardening, rentable by industrious art lovers who wish to tend the plants. I’m not sure if anyone signed up, but the oases of natural beauty enhance an already pastoral scene. Josef Bernhardt installed a grove of birdfeeders on posts, creating a protective environment for sleeping ducks. Josef Bernhardt, an Austrian who laments our destruction of animal habitats, installs one of his trademark grids of bird-nesting boxes on poles. “We have lost our contact with nature, and therefore also with ourselves,” says the environmentalist, whose 2005 work has been shown in Japan and Vienna. Waiting for Birds was still waiting for residents when I left town, though ducks reportedly have taken to sleeping within the protective grove of the birdfeeder supports. Undertones of environmental policy emerge from a work by Heather Allen, a British artist resident in Berlin. Two diminutive bronze figures precipitously climb a trussed-metal oil derrick, apparently dramatizing the perils of reliance on petroleum. And ethnic politics come to the fore in Róza El-Hassan’s wicker totem Exclamation Mark, for which the Syrian-Hungarian artist commissioned Roma basket weavers from a camp in Szendrölád, Hungary. “The exclamation is the voice of those excluded undeservedly,” she says of her ostracized collaborators. Zénó Kelemen’s spiral Rounded Loop, the only abstract sculpture in the show, was purchased by a local insurance company. It was surprising to find only one non-figurative abstraction gracing the lake. Zénó Kelemen’s Rounded Loop is a spiral Moebius form in white resin, with embedded LEDs that light up at night. A local insurance company bought the young Hungarian’s piece for their Budapest headquarters. Naturally several artists fabricated nautical crafts. The Dutch artist Paul Segers dabbles ironically with the machinery of war in The Southern Front (ZFU-05), a 10-metre long air strip replete with landing lights and a shed that rests on pontoons and looks like an abandoned mobile military unit. Another rudimentary vessel is by the senior German artist Günther Uecker. His minimalist frigate consists of six square sails suspended in a row between masts mounted on floating barrels. 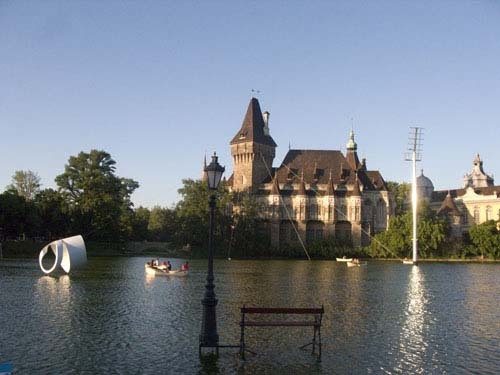 The contraption, which pivots in the wind, was designed for the set of a 1979 production of Wagner’s Lohengrin at Bayreuth, and Uecker donated this reconstruction to the Budapest MFA, which Tolnay says will organize an Uecker show in 2012. Laurens Kolks’ Private Investigation offers boaters a view of the show from behind tinted glass. Laurens Kolks (b. 1976), a young artist from Rotterdam whose career has spanned industrial and interior design, has created a small cabin-boat with tinted windows that enables visitors to paddle the pond in seclusion. Private Investigation permits clandestine participation in public-art, but it was difficult to gauge whether any couples took full advantage of the opportunity. I don’t know what to make of Austrian Brigitte Kowanz’ red buoys, some cylinders and some spheres, that spell out an indecipherable message in Morse code. Nor did I care for Gert Robijns’ chair resting on an archipelago of curvilinear islands that we are told outline the shapes of Mickey Mouse and Donald Duck. Then there is a work by Susana Solano, the Spanish artist, who placed a broad plate of metal on the concrete floor of the lake. Consider it a kind of underwater Carl Andre, if you like, but it struck me as weak and lazy. “Art on Lake” may not be a collection of masterpieces, but the show seems to be serving its purpose, which is to introduce contemporary art to an under-informed public. Hungarian curators and artists tell me that the city’s cultural awareness is about as up to date as City Park’s faux medieval castle. And no wonder – the 1.7 million residents have almost no exposure to contemporary art. The Ludwig Museum, established in 1989 with about 70 postwar works donated by the late German chocolate magnate, is the de facto national museum of contemporary art, but its collection remains small and its relocation in 2005 to the Palace of Arts — an unimaginative glass-and-steel structure overlooking the Danube on the city’s eastern outskirts — has resulted in low attendance. The collection galleries and a well organized retrospective (closed July 3) of Croatian conceptualist Mladen Stilinović (b. 1945) were vacant on a weekday afternoon when I toured with curators Branka Stipančić and Katalin Székely. So was the survey (closed July 31) of paintings, drawings, and films by Belgian artist Michaël Borremans that filled the great Kunsthalle, across Heroes Square from the MFA, when I visited with curator Zsolt Petrányi . [The Ludwig has a László Moholy-Nagy exhibition on view until September 25.] I did not visit the handful of commercial galleries, but it is noteworthy that the 300-plus galleries at Art Basel in June included only one from Hungary (Vintage Galería). The lake show is a gentle effort at consciousness raising. Co-curator Tolnay, told me that “the majority of people here do not go to museums [and] there is no tradition of contemporary art. Sculpture in a public space must be a general on a horse or a metal poet. This project is democratizing the art, getting it out of the ghetto of the happy few.” MFA director László Baán says the idea was to place work outdoors where an encounter was insured even for those unaccustomed to stepping inside a museum. “In Hungary people are pretty conservative. Contemporary art is not so fashionable,” says Baán, noting that a Luc Tuymans show attracted 5,000 visitors in Budapest and 50,000 in Munich. “It’s an educational process,” he says, “to show them it’s not so dangerous or inaccessible. It’s an important gesture bringing contemporary art and the public together,” he says. This is not the first time sculpture has been presented on City Park Lake. In 2000 it was the site of a millennial show of Hungarian art, organized and sponsored by the State with support from private companies. The current project is the first outdoor exhibition under the auspices of the MFA. Most of the 500,000 Euros budget was covered by the State with additional funds from the E.U. and private sponsors; some artists received support from their home countries. Access to the exhibit is free, but boat rentals cost 1500 HUF an hour, and have been quite popular. In fact, the show is doing so well that Baán says he would like to establish a triennial open-air project of some kind. Whether or not that dream comes to fruition, “Art on Lake” already has made a splash in that direction. 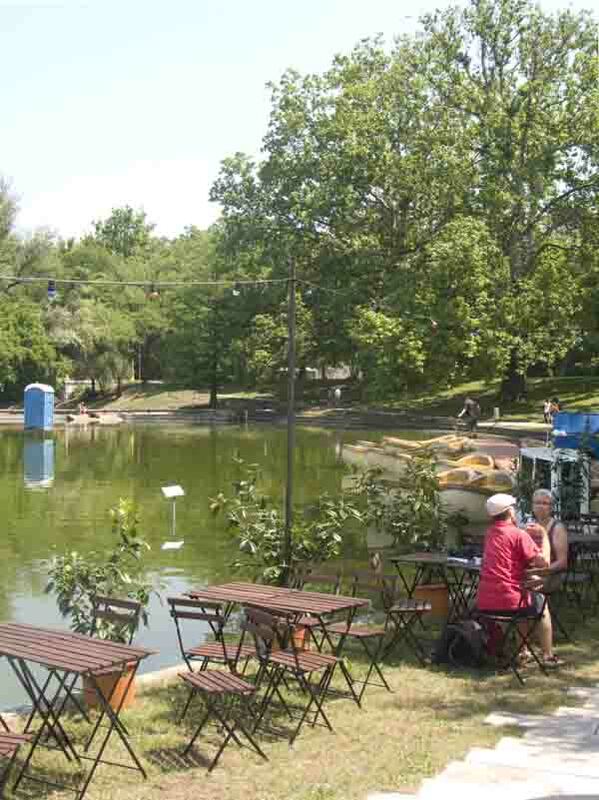 “Art on Lake,” organized by the Museum of Fine Arts, Budapest – City Park Lake, Budapest. Through September 4, 2011. To read more about Budapest and its museums, return here soon for Part 2. .
Pingback: Anne & Patrick Poirier transplant cultural memories at Art on Lake « Art Matters! Thank you for writing, Rebecca. You bring up a crucial point. My understanding is that the overall budget was around Euros 500,000, with around 80% provided by the Hungarian government, much of that with funds from the EU for Hungary’s term as president. Some private companies also contributed. But the artists were not given equal budgets. Many relied on funding from their home countries. And some of the big name artists sent older work from stock. As you note, despite it’s taking place on a lake, the exhibition was hardly a level playing field. Pingback: Sculptor Krzysztof M. Bednarski molds Karl Marx into an iconic pink fountain « Art Matters! Pingback: Sculptor Magdalena Abakanowicz gives Budapest the ´Bird´ « Art Matters! Pingback: Makipaa and Ulfarsson display eco doom at Art on Lake in sinking ‘Atlantis’ « Art Matters!